Who needs fiction when blogs are there or when truth is stranger than fiction? Warrren Adler Short Story writer was at Amazon Island in Secondlife to share some of his Short Story writing tips. It is natural to understand his lament that “short story has gotten a bad rap during the past few years and many outlets for this medium have closed”. Well, when some doors close, some other doors open. As demonstrated by his SecondLife presentation itself. 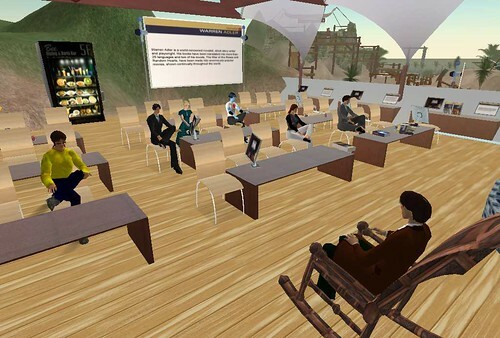 Hey, when an 80+ year old non-techie uses any form of digital it is worth celebrating, when he uses the edgy SecondLife to talk about literature it is a landmark event. As I unserstood from the session, the story has a start, the middle and the climax. Purpose of start/build up is to set the context for the middle. And in the main, there must be conflict. Make the characters as plausible and keep the conflict logical. That is the way to make the reader relate. Once this tension is built, climax is the way to release the tension in any particular way. Climax is an opportunity to infuse your unique point of view to the situation. This creative high is what authors live for and Warren Adler is no exception. WarrenAdler Aeon: In this last story a nice older woman sits on her favorite bench in central park reading a novel;. [12:58] WarrenAdler Aeon: Another woman sits next to her and beging to annoy her by using her cellphone to change the venue of a fancy party she is having.She is particular loud and annoying and after awhile this nice lady asks her to please lower her voice. She tells her to go away.and continues to bew loud and obstrreperous.The nice lade is motified by her behavior. After she changes the venue of the party to another restaurant she says something nast and leaves. The mild mannered nice lady who has never hurt anyone in her life and has overheard the woman, calls the new venue and cancels the womans’ new party. What do you think? Short Story Contest Mr. Adler will discuss his short story contest and why he decided to start it. He will also announce the winners and discuss each story and why he chose them. If possible, contest entrants will convey their story lines or read the stories. Mr. Adler will talk about his novel FUNNY BOYS and how it took shape. He will describe the era that is described by the term “Borscht Belt”, how it came about, what life was like then (1937) and the brutal gangster era at the time when Murder Inc., a group of Jewish and Italian killers, was in its heyday. Join “Warren Adler Fans” group in SecondLife for notifications. If not anything, you can watch unleashing of the digital age – see how Amazon Shorts or SecondLife is able to collapse geography! This entry was posted in Second Life, Secondlife, secondlife.com, taking web2.0 to real world, technology and tagged Amazon Shorts, curxy, short story writing, Warren Adler. Bookmark the permalink. The Queen is pregnant. Who did it? We are discussing short story here – as in fiction. Not tabloid. Let me resolve the confusion. Something that is short and has a story on it is not short story. As in: Sack of book on Donkey. But if the donkey eats the books and becomes light(and laughs) – that might be a short story. Rather a part of it. He he. Thanks for the visit! Hat tip for the flash story . Arrival of the Second Life Lottery. you stay in play until you win a prize. this company could very well turn all games of its kind around. The idea for this bright idea came from two young adults from Edmonton Alberta Canada. as SilkySmooth Decosta on secondlife…at silkysmoothdecosta.com and at ssdecosta@shaw.ca .